Easter in Rome with family. What could be better? On Good Friday, Tom and I headed off from Ostuni, via Bari, on the Frecce Argento (high speed train) arriving at busy Rome Termini railway station at 17.20, exactly on time. 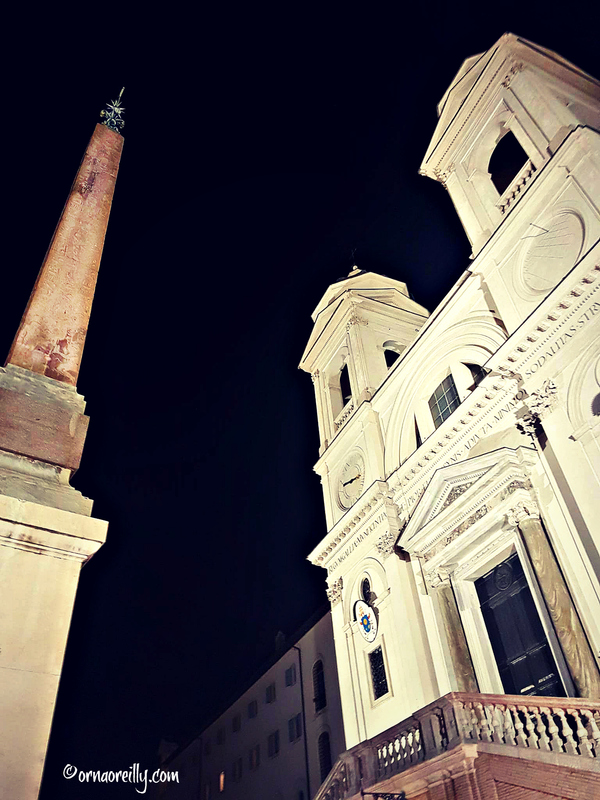 Jumping into a taxi, we were at our favourite Roman hotel, Scalinata di Spagna, wonderfully positioned at the top of the Spanish Steps opposite the church of the Trinità dei Monti. Soon we were at the large, family restaurant, Il Pomodorino, just a ten minute walk away, nibbling succulent supplì with family; I’m convinced there is no better way to spend an evening, especially at Easter Weekend. As we have both visited Rome on countless occasions and seen most of the major sites, we imagined that this would be perfect for us. We were not wrong! 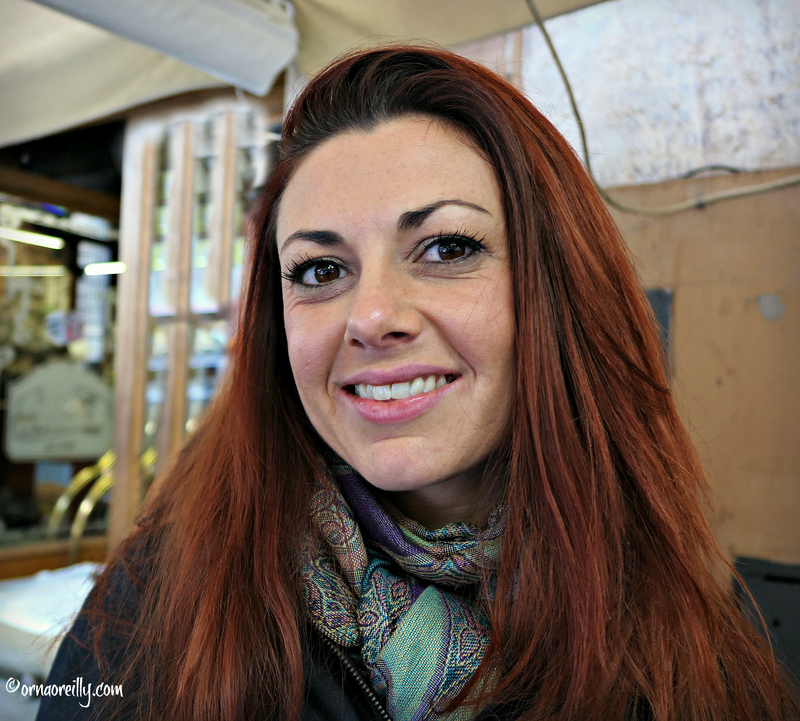 We met our guide, Melanie, along with a further seven visitors at the Antica Caffe beside the Theatre of Marcellus. The rain had begun to pour down and I was concerned about my handbag and camera, as the first 45 minutes was to be on foot. Luckily, there were plastic ponchos selling for €5 apiece in the caffe and I, along with two others in our group, purchased this very useful coverall. Unfortunately, mine was pink and I felt I resembled a large candyfloss, but it certainly did the trick. 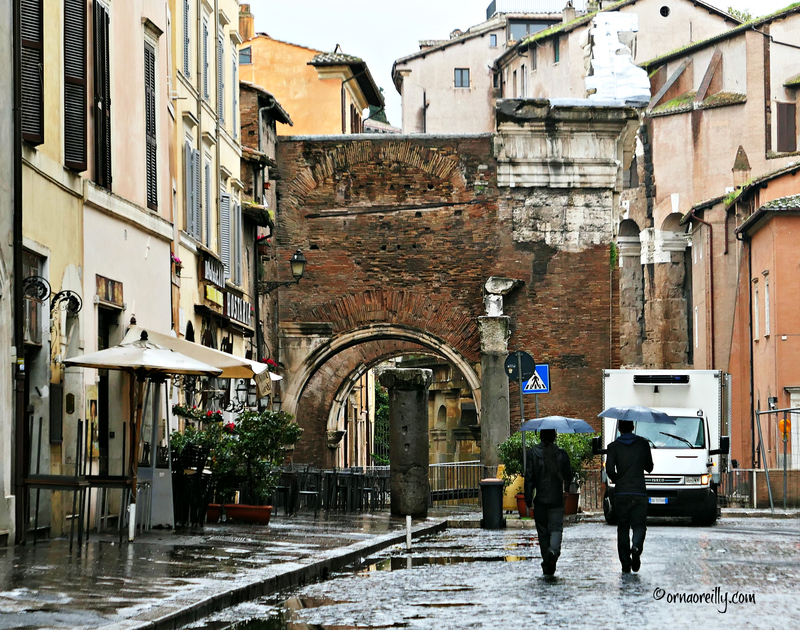 Bravely setting off into the downpour, we began our walk by entering the old Roman Ghetto, where, back in 1555, an unusually bigoted Pope Paul IV issued a Papal Bull incarcerating the Jews of Rome in this area on the banks of the River Tiber. 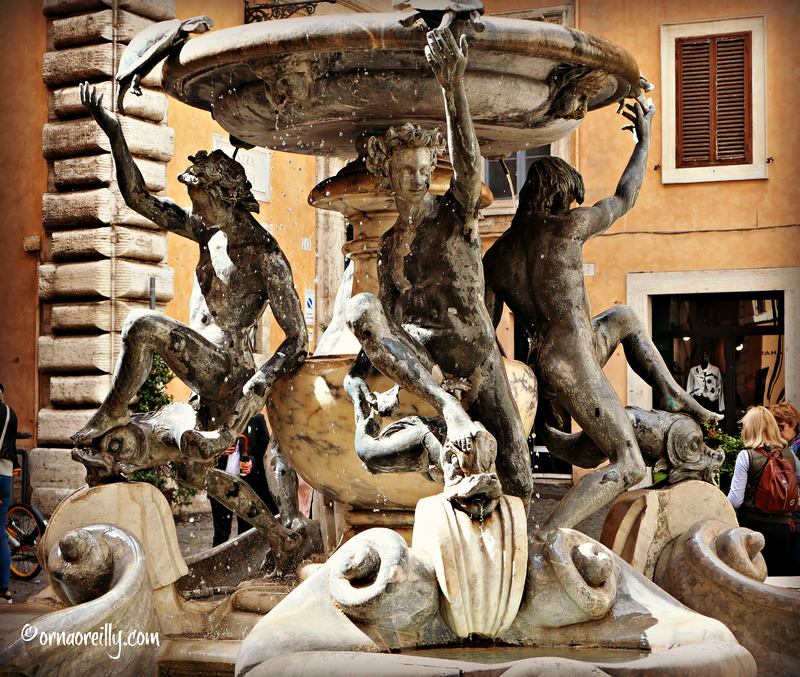 Our first stop was at the pretty Fountain of the Turtles in Piazza Mattei. A Renaissance fountain, it is decorated with turtles and positioned in this small piazza named after the powerful Mattei family. Melanie had an interesting tale to tell regarding its provenance and the rain, now coming down hard, seemed of very little consequence. The only downside was that it was impossible to take a decent photo, so Tom and I returned later to do so when the sun was shining. 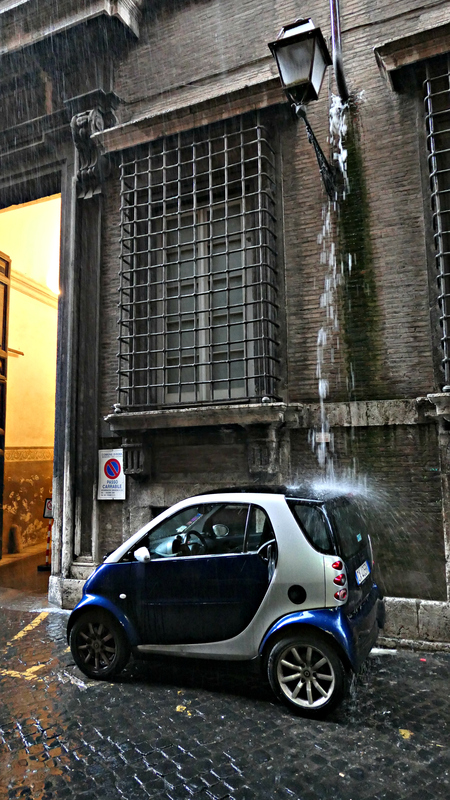 Splashing through the wet streets, we arrived outside the Jewish Museum, the main Synagogue of Rome. As we walked, we passed several brass inserts in the pavements outside many of the apartment blocks. These represent various Jewish inhabitants who were taken away during WWII, never to return. It is a great credit to Melanie that I soon forgot about the rain drumming on the top of my head and became completely engrossed in her interesting narrative. She is a born storyteller and she brought the tragic history of the inhabitants of the Ghetto to life. 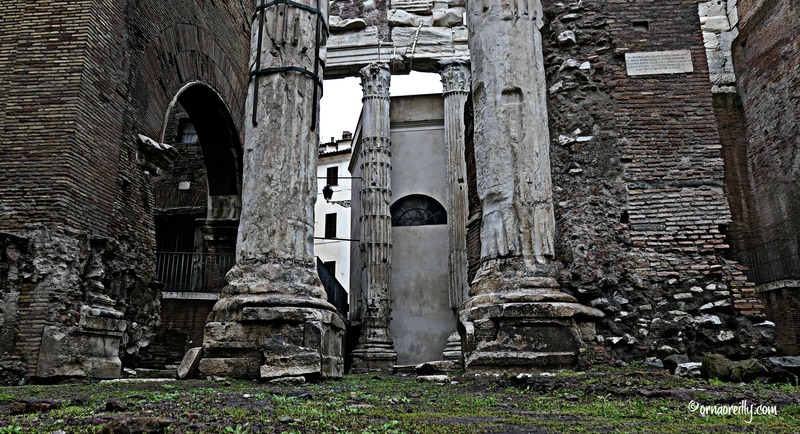 Arriving at the Portico of Octavia……. 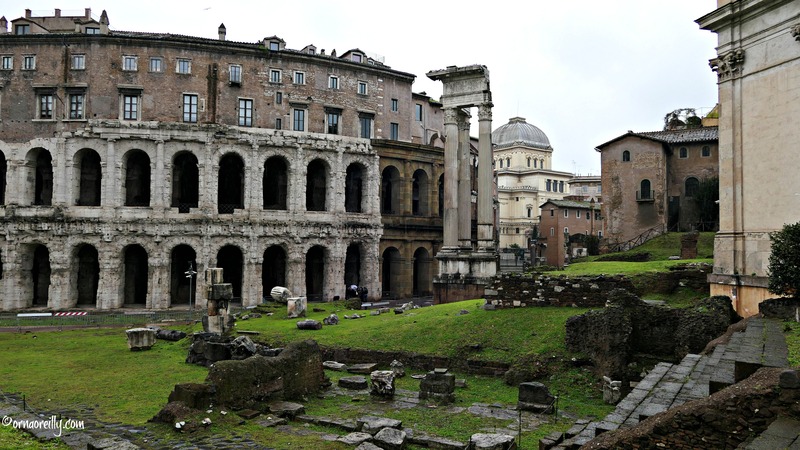 ….we approached the outer walls of the Theatre of Marcellus. I noticed that there were apartments built over the ancient teatro and I asked Melanie about them. She told me that, apparently, Sophia Loren owns one of these luxury dwellings, which are valued at many millions of Euro. It must be fascinating to live on top of what was once an ancient open-air theatre. 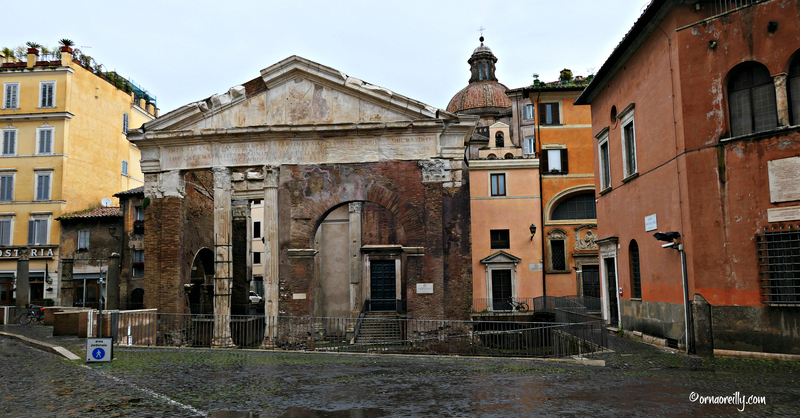 For fact finders, Teatro di Marcello was completed in 13 BC and formally opened in 12 BC by the first Roman Emperor, Augustus. 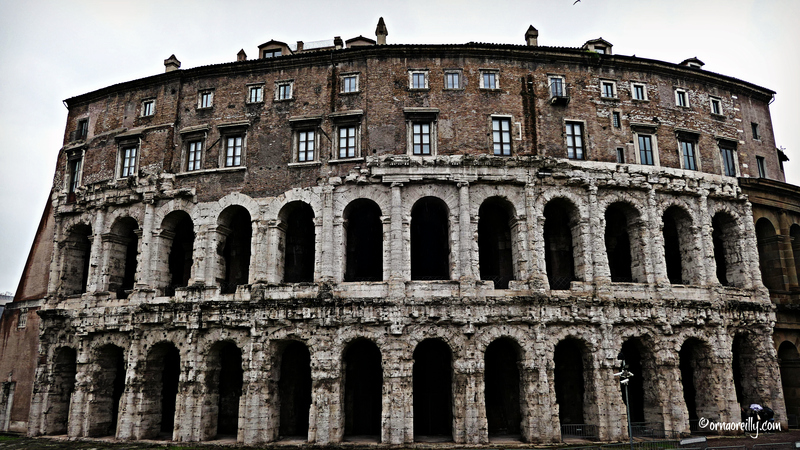 The theatre was used for outdoor plays and concerts attended by the locals until the 4th century. Much later on, in the 16th century, the Orsini family built their residence on top, where it is now divided into several extremely expensive apartments. Our walk took us past the ruins of the Temple of Apollo Sosianus, then up a flight of steps, back to the Antica Caffe and a small bus which awaited ten dripping and bedraggled souls. Next stop was the Circus Maximus, meaning ‘largest arena’, which was the main venue in ancient Rome for chariot racing and public events, accommodating more than 150,000 spectators at a time. 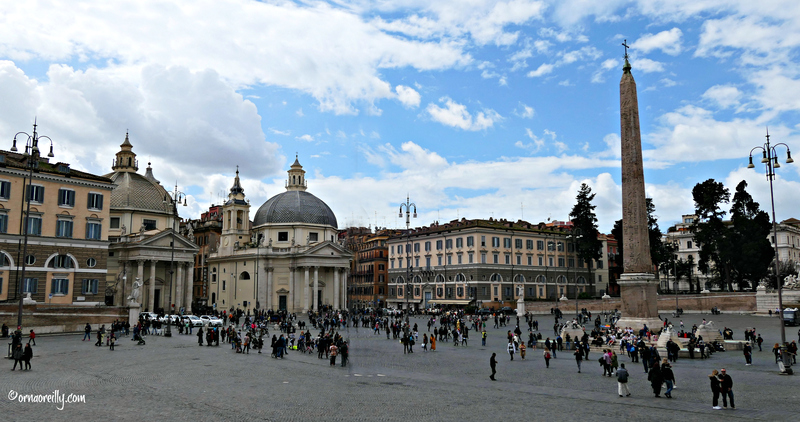 The ancient Egyptian Flaminio Obelisk, which was once the centrepiece of this vast arena is now to be seen in Piazza del Popolo. 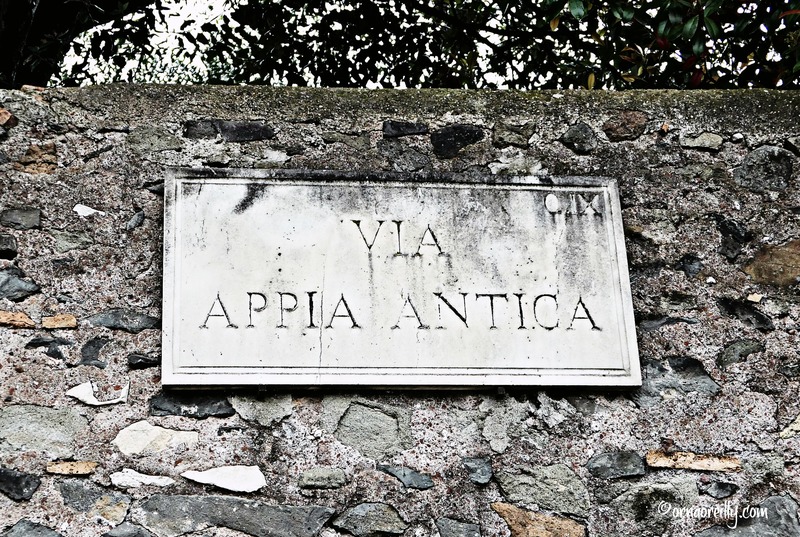 Arriving at the famous the Appian Way, the ancient Roman road which stretched from Rome to Brindisi in Puglia, we alighted from our bus close to the tomb of Cecilia Metella, a Roman noblewoman. 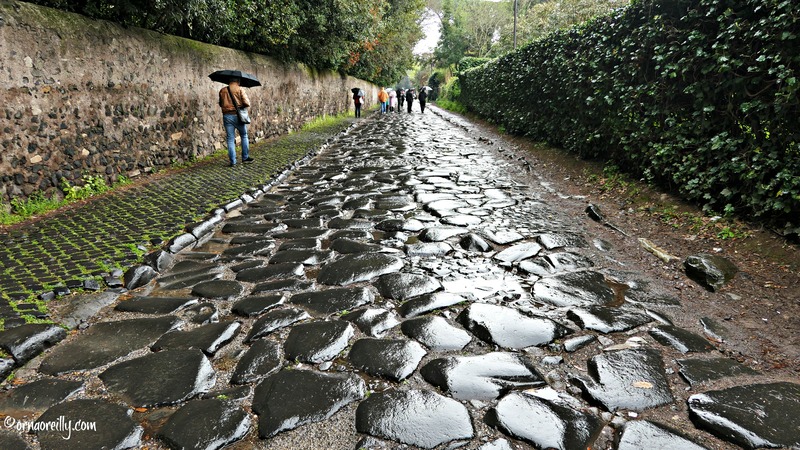 We then walked on the original stones of Appia Antica, which were laid in 312 BC and I was excited to know that I was actually walking in the footsteps of the Roman Emperors and St. Peter. 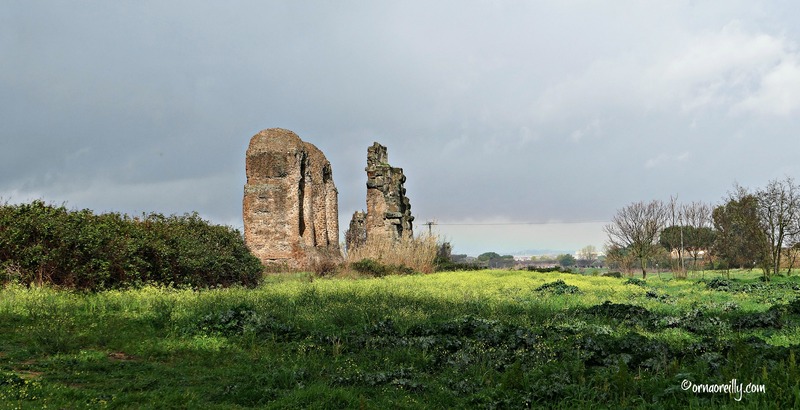 Parco dell’Appia Antica is now a regional park incorporating the first 12 kilometres of the Appian Way and its many monuments. Clambering aboard our bus once more, we were driven to Parco degli Acquedotti (Park of the Aqueducts). This is a public park, just eight kilometres from the centre of Rome, near the airport of Ciampiano. 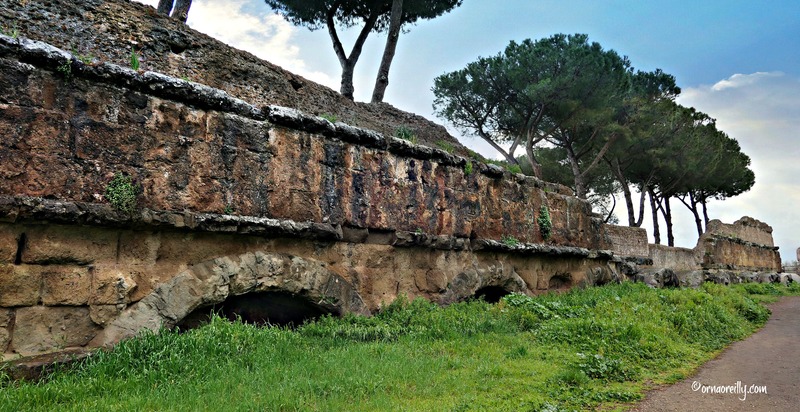 It is part of the Parco dell’Appia Antica and is a public park full of ancient aqueducts, the most striking being the Aqua Claudia, commissioned by the Emperor Claudius. There is a golf course and tennis courts and we saw several walkers and joggers out and about, but it is a quiet spot and it felt as though we were miles from anywhere, in the countryside. As we sloshed our way through the puddles caused by the recent heavy rain, the sun peeped out from behind the clouds and the rain was over. I found the ancient aqueducts pretty awe-inspiring. This was, for me, the highlight of the tour. Continuing the fascinating theme of the lives of the ancient Romans, I was intrigued when the bus came to a halt alongside a vast pinkish building. 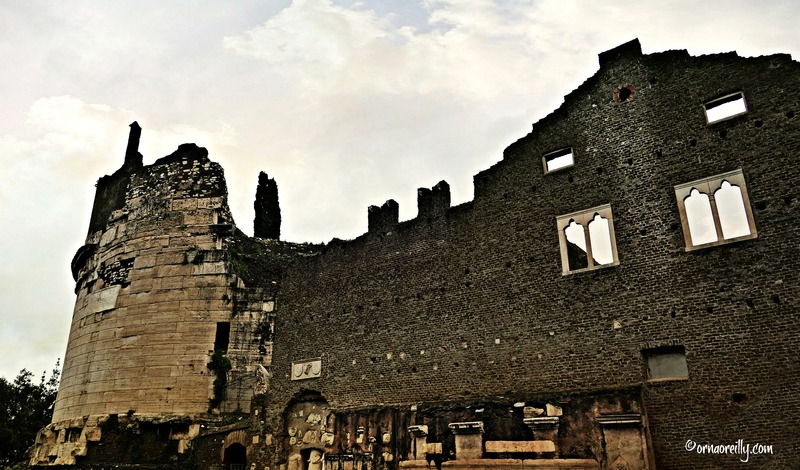 This sprawling ruin housed one of the oldest and largest Roman Baths and is called the Baths of Caracalla. 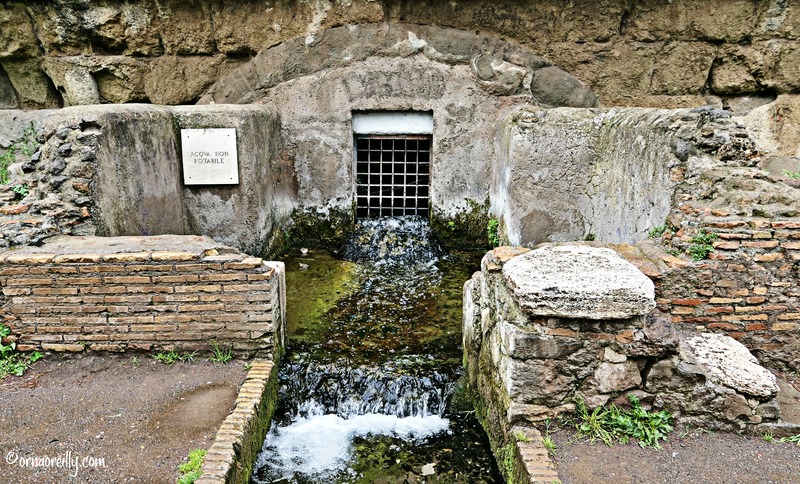 Built around 212AD during the reign of Emperor Caracalla, these baths were a popular venue for both bathing and relaxation until the 6th century. It is open to the public and next time I’m in Rome, I plan to visit. Heading uphill in much improved weather, we arrived at Piazzale Giuseppe Garibaldi on the Janiculum (Gianicolo) Hill. 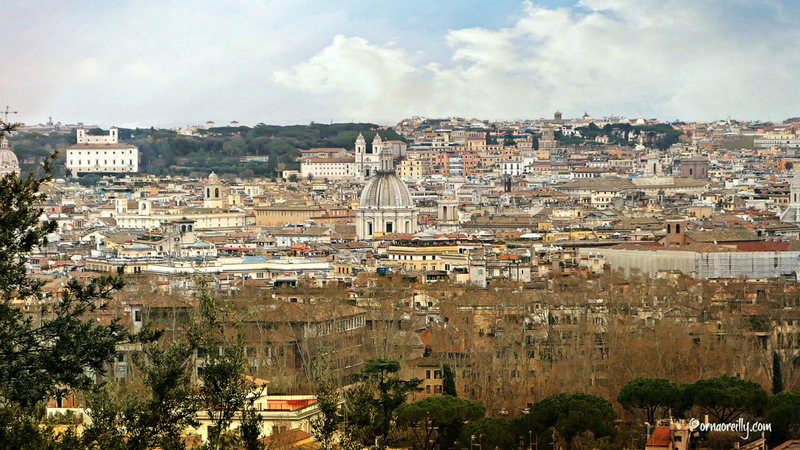 This is the second highest hill in Rome, but is not one of the famous Seven Hills, as it is outside the boundaries of the ancient city. 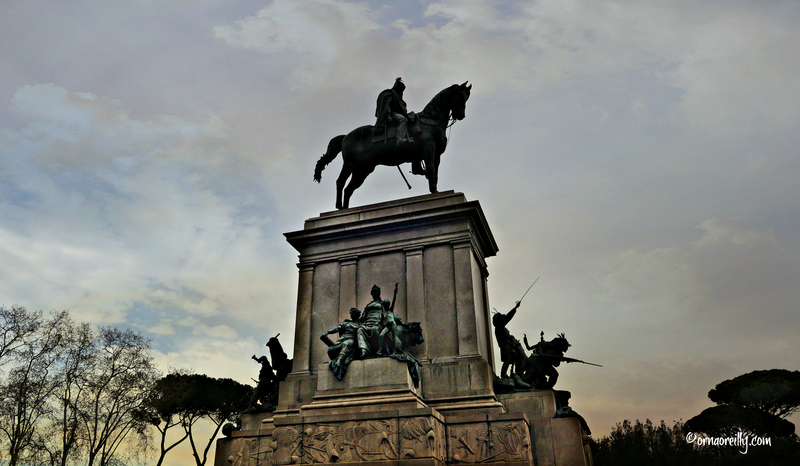 At the famous overlook, the statue of the great Italian hero Guiseppe Garibaldi looks out over the city. As we arrived, Melanie announced that there was a treat in store. We assembled at the railings, along with a large crowd of visitors, and looked down to see a cannon being wheeled into position. A cannon has been fired at noon every day since 1847 when Pope Pius IX decided to ensure that all the noontime church bells would ring out at the same time. So, with a deafening bang, 12 o’clock was announced. Our driver then drove a short distance from the Janiculum Hill and headed down a side street where the dome of St. Peter’s Basilica is clearly visible. As we got closer to the dome, it appeared to shrink, though this is not immediately evident from my photographs. Apparently, it is an inexplicable phenomenon and can only be seen from this particular spot. Alighting from the bus once more at the Antica Caffe, we bade farewell to Melanie and thanked her for a most entertaining morning. 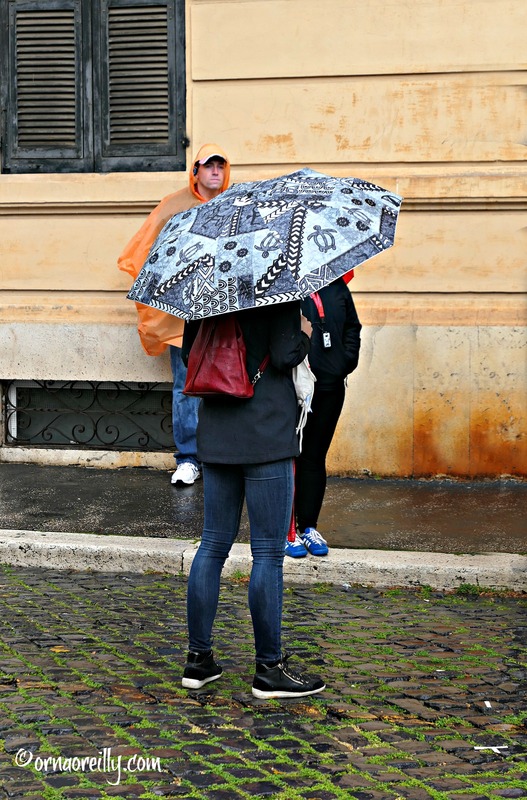 We especially enjoyed the experience of being able visit places where a large tour bus could not possibly go and where we did not have to jostle for space with the hordes of other visitors that flock to Rome. As soon as we were on our own again, we walked speedily back to one of the restaurants we had passed in the Roman Ghetto earlier in the day. 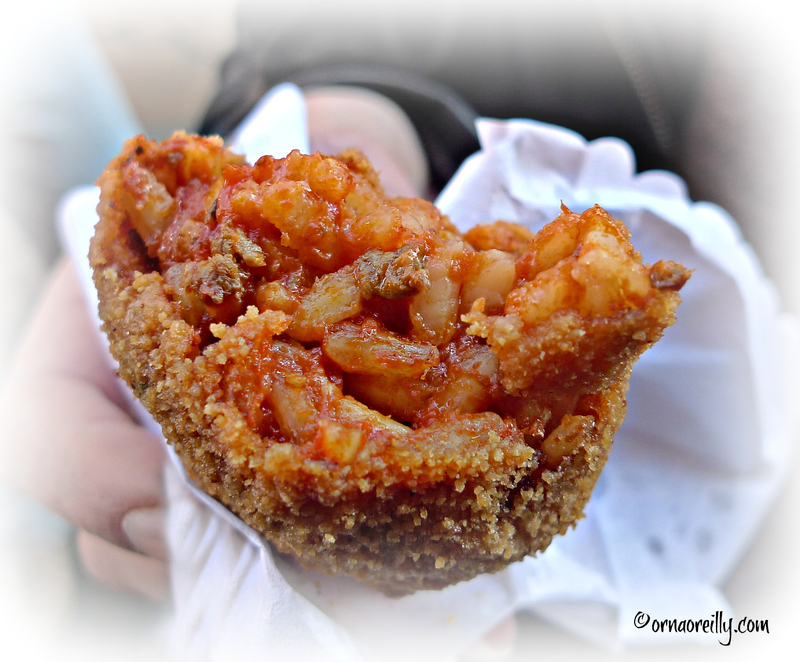 Our eagle, foodie eyes had spotted the magic words Carciofi alla Giudia on the menu outside Giardino Romano. So, replete and happy after our deep fried artichokes and a plate of Saltimbocca alla Romana each, we wandered back to our hotel for a well earned siesta. Tom Weber and I were guests of Walks of Italy. You are a hearty soul! 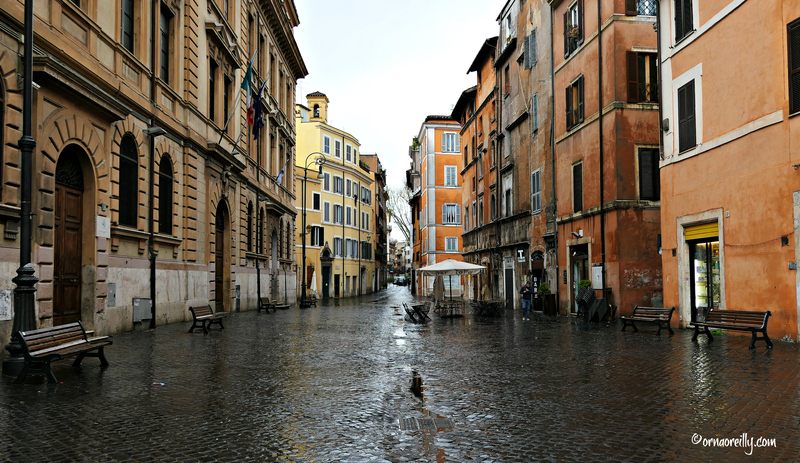 That type of rain makes me want to curl up in the bed of my hotel room … or find a museum. But it paid off with a good telling of an interesting tour. Real … better than perfect. Sounds marvelous, Orna, and thanks for letting me tag along. I’d love to take this tour in person one day, preferably without the rain and your after-tour-meal sounds delightful. Glad you had such a wonderful Easter. Love to you both. HI Orna, I’m an avid reader of your travels (I live in Ireland) I’d love a few recommendations for when I visit Italy this summer could I email you? Thanks & really like your blog.